Home › Target Market › What’s The Difference between Your Target Market and Your Ideal Client? You’ve been working to get your clients to know, like and trust you. It’s your number one marketing focus, isn’t it? You’ve built a strong and deep foundation for your business – your ads; your Social Media presence; your branding; your website and your ezine. As an entrepreneur, I think it’s built in to our minds to want to fling our arms out wide and make our offering to the world’s population, because surely in all that, there will be some folks who really like what we offer, won’t there? Narrowing down the niche or target market for an entrepreneur can be difficult. Think of all the opportunities we’d be missing by not marketing to everyone! You will be offering to one special segment of the market exactly what they want! No more will the whole world of clients wander into your business wondering if you’ve got what they need. They’ll know for sure you’ve got it, and, they’ll also know that how you will provide that service is exactly what they like. It’s not just about finding your Target Market. It’s about finding your IDEAL target market because these people value what you do. They are profitable (B2B), or can afford your service (B2C), and they already refer your business. Let’s look at these marketing tools and make sure we understand what goes into narrowing down your target market. Data is available to your business in different formats. First, there are demographics, the statistics about a given population (or the sub-set of a population) made quantifiable. Demographic data examines gender, age, education, income, home ownership, employment, marital status, family life style, ethnic background, location, and languages – mainly hard data. Sometimes, demographic trends are examined to see how decisions change over time. Will you be marketing your services to other businesses (B2B) or directly to consumers (B2C)? B2B looks at industry, type of business, revenue levels, employee count, size of building, access to transportation for shipping, etc. B2C examines more of the hard data already listed. Essentially demographics can be viewed as data about the population of a region and the culture there. Secondly, we look at psychographics, which is the study of personality, values, attitudes, opinions, interests, and lifestyles. Think of it as “social research.” I like to think of psychographics as soft data. If you merge the soft data with the hard data, you’ve got a great amount of information about your Target Market, and you can readily begin to see patterns of what doesn’t need to be in there. When you merge the hard data of demographics and the soft data of psychographics, you get definitions like Baby Boomers or Gen Xers. If you need demographic or psychographic information, just type “how to obtain demographics” or “how to obtain psychographics” into Google and go from there. Over time, you’ll find the perfect websites containing the best marketing information for your target market segment. Write a description of your Ideal Buyer: what they do; what’s important to them; why they’d do business with your company. If you have more than one segment of Ideal Buyer, write a description for as many as you have. Identify your Ideal Clients’ goals and those features that would make them want to buy from you. Get into their minds and see what keeps them up at night, what their main objections to buying from you may be, and what the very best way to engage with these clients is. 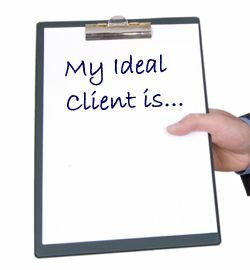 How will these Ideal Clients find you? Website? Social Media? Blogs? Which keywords will they be using? What kind of content do they prefer? Brainstorm with your staff about ways that your company can cater to your Target Market and the Ideal Clients in it. Make a long list. Begin to implement in the order in which you think they’ll appeal to those clients the most. It’s sometimes helpful to create one Ideal Client Profile from your narrowed-down Target Market and give him a fictitious name that nails who you’re trying to serve best; i.e. “I Need Answers Andy. Make him a person, not a “target.” If you keep that ideal person – “Andy” – in mind using your demographics, your psychographics and within your specified geographical area, you’re in for an improved sales and client satisfaction experience.